While there have been many schools of philosophy throughout history, we need to be selective in order not to lose sight of our own objectives within the myriads of ideas that litter history. From almost any perspective, early Greek philosophy represents a turning point in rational thinking about the underlying nature and purpose of the universe. In many ways, Greek philosophy was to provide some of the foundation stones on which many future theological beliefs and scientific theory were to eventually develop in the following millennia. Therefore, when we consider Greek philosophers, it is difficult to pigeonhole their ideas as just philosophical, as today; many of them would be classed as mathematicians, astronomers, physicists and theologians. In order to get some scope of the development of ideas that came out of Greek philosophy, it is worth briefly outlining the chronological development of some of their key conceptual ideas. 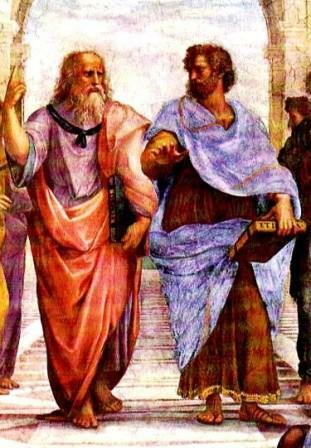 The following overview outlines some of the major schools and developments of Greek Philosophy. This school could be attributed with taking some of the first steps, from mythology to science, by attempting to rationalize the world through natural mechanisms. Thales, who lived about 580BCE, is one of the first Greek philosophers whose teachings survived to modern times. Anaximander, a pupil of Thales, proposed that all things evolved from an intangible, invisible, infinite substance called `Apeiron`. Pythagoras founded this school around 530BCE. His school was more religious and mystical than the Ionian school using mythology and theology plus scientific ideas to explain their world. As a generalization of their position, they believed that the soul is released from the body at death and then reincarnated in a higher or lower form of life depending on the degree of virtue achieved in life. Like many Greek philosophers, they also believed that all things are made up of numbers and geometrical figures. Of course, Pythagoras is still associated with geometry to this day. Heraclitus noticed that heat produced changes in matter and, in a sense, was providing a foundation stone for a theory of energy. He maintained that all things are in a state of continuous flux and therefore stability is an illusion of the mind. Empedocles and Anaxagoras conceived of the idea in which all things are composed of four irreducible elements: air, water, earth, and fire. However, they initially failed to explain the mechanism by which objects develop from the elements, which have fundamentally different properties. Subsequently, Anaxagoras suggested that all things are composed of very small particles, which exist in infinite variety. Again, it could be argued that this idea is a forerunner of the atomic theory of matter. With hindsight it seems a natural step from the pluralist to atomist school of thought, which believed all matter is composed of tiny, indivisible particles differing only in size, shape, and weight. It was Leucippus who made this consolidation, although it is more generally accredited to Democritus. This is also considered the starting point of a `materialist` approach of looking at the universe, in which all aspects of existence are said to be determined by physical laws. The maxim of the sophist school is that `man is the measure of all things`. As such, individuals have the right to judge all matters for themselves. However, this philosophy of `self` also proclaim that ethical rules need only be followed when it is advantageous for the individual to do so. Clearly, we should note that the rationalism of philosophy does not always lead to a morally acceptable conclusion. Socrates, born in 469BCE, is perhaps one of the better-known Greek philosophers. While there are no direct records of Socrates work, his equally famous pupil Plato did preserve many of his teachings. According to Socrates, every person has knowledge of the ultimate truth within his or her soul and that a person's conscience is the key to its access. His contribution to theology was not a systematic doctrine, rather an identification of a need for analytical examination of deeply held beliefs, plus a rational and critical approach to ethical problems. Like many of the great Greek philosophers, it is difficult to summarize Plato's life's work into a few sentences. However, the cornerstone of Plato's position is often associated with his `Theory of Ideas` or `Doctrine of Forms'. One of the main tenets of Greek philosophy is with the underlying order of the universe. Euclid, a Greek mathematician, had proved that there are only five solid shapes that can be made from simple polygons. Plato was strongly influenced by this mathematical discovery plus the philosophy of Empedocles', although revising his four-element theory with the proposition that there were five elements to the universe, i.e. earth, water, air, fire plus quintessence, which corresponded to the five regular solids. A physical universe of everyday objects. A mathematical universe of perfect forms. This idea allowed each instance of an everyday object to differ slightly from its perfect form, while still being recognized as a member of that form. Plato argued that mathematical laws governed all of nature and, as such, mathematics was not an invention of humanity, but rather the discovery of its independent existence. In fact, the corollary of Plato's argument suggests that the deeper we try to examine physical reality, the more we will become aware of a larger reality comprised of mathematical truth. Of course, there are other schools of thought, which hold to the alternative notion that mathematical concepts are simply idealizations of the physical world. As such, Plato's world of perfect form exists only as an extension of the physical world. While we will not pursue this point, at this stage, we will come back to this issue at a later point. In his scheme, the soul was the perfect form of the body. Humans had a rational soul that was a higher form than the souls of other species, although still `perishable`. In contrast, the heavenly bodies of the night sky were composed of an eternal and imperishable substance, which were moved in a perfect circular motion by God and therefore higher in the order of nature. Many Christian, Jewish and Muslim theologians were later to adopt this hierarchical classification as being consistent with their religious beliefs. However, Aristotle is also remembered for his consolidation of Greek philosophy into a cosmological model of the universe. Today, we might describe the various Greek schools as more philosophic than scientific. However, this philosophic reasoning and inquiry was to eventually become one of the foundation stones of modern science, albeit, if it was initially lacking in empirical verification.